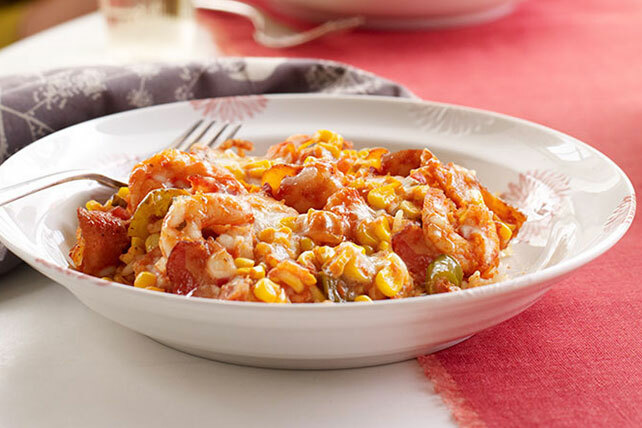 Make-Ahead Cheesy Shrimp & Rice is an almost perfect name for this delicious dish—all that's missing is the word bacon, the first ingredient on the list. Cook and stir bacon in large skillet on medium heat until crisp. Remove bacon from skillet with slotted spoon, reserving 2 Tbsp. drippings in skillet; drain bacon on paper towels. Add onions, peppers and garlic to reserved drippings; cook and stir 5 min. or until crisp-tender. Stir in tomato sauce and salsa; simmer 2 min., stirring occasionally. Stir in shrimp and corn; simmer 2 min. Stir in bacon. Spoon rice into 13x9-inch baking dish sprayed with cooking spray; top with shrimp mixture and cheese. Cover with foil. Refrigerate up to 24 hours. Heat oven to 375ºF. Bake casserole, covered, 35 min. or until heated through, uncovering after 20 min. Add 1 tsp. hot pepper sauce to shrimp mixture along with the cooked bacon. Garnish each serving with 1 Tbsp. chopped fresh cilantro.